A Southwest Airlines plane carrying more than 100 passengers landed at the wrong Missouri airport Sunday, the company said. Southwest Flight 4013 from Chicago's Midway Airport was scheduled to land at Branson airport on Sunday evening, but it instead showed up at Taney County airport, said Brad Hawkins, a spokesman for the airline. Hawkins said he didn't yet have enough information to say why the plane landed at the wrong location. The director of the Branson airport said the passengers were being taken by bus and other vehicles to the correct airport. There are no injuries reported. The Federal Aviation Administration said it is investigating the incident. 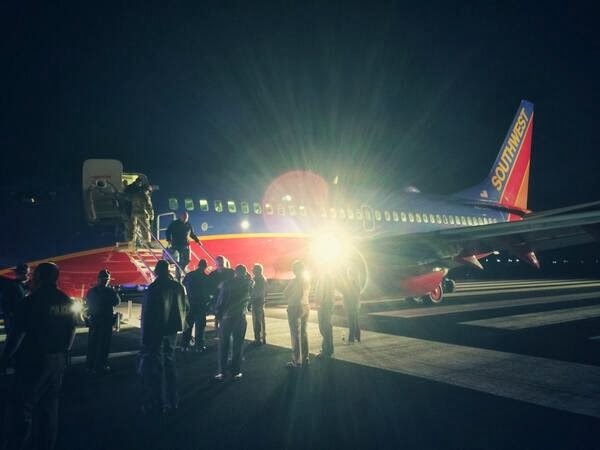 The Southwest Airlines Pilot in command of flight #4013 safely landed at (PLK) Taney County airport this evening. The Boeing 737-700 carried 124 Customers and a crew of five and was operating as a scheduled flight from Chicago Midway to Branson. Our ground crew from the Branson airport has arrived at the airport to take care of our Customers and their baggage. The landing was uneventful, and all Customers and Crew are safe.